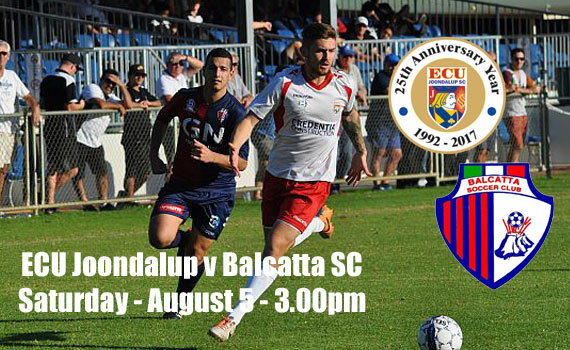 The Jacks are at home again this week when they entertain Balcatta at the ECU Joondalup Stadium in Week 23 of the PS4 National Premier League WA. The Jacks will be looking to bounce back from their narrow loss against Bayswater City last week, a game they dominated for large parts, but Coach Dale McCulloch said they gave Bayswater a helping hand in the second half. “Yes last week saw us go down at home to Bayswater City 2-0, in a game I thought we dominated for large period’s but mistakes cost us,” he said. Balcatta come into the game looking to end a five game streak without a win. They were well beaten at Perth last week, and their last win was in the local derby against Perth Glory in round 17, and they need to start finding results sooner rather than later if they are to stay in the top flight. McCulloch is well aware Balcatta will be desperate for a win and they need to be on song, and he’s hoping his side can finish the season well, starting Saturday. “Balcatta are fighting for their NPL lives and they will up for Saturday’s game, so we need to be strong,” he said. “But we are looking to bounce back and get back to winning ways and end the season with five wins.” In team news for ECU, skipper Jon Higgins limped off last week and is in doubt, while Fraser Greenwood will miss again after having surgery last week.